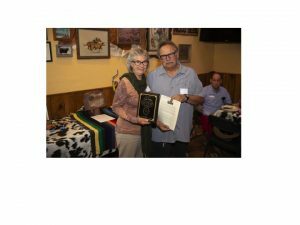 The El Paso Archeological Society President Fernando Arias presented Joan Price with their 2018 Award of Distinction “in Recognition of Her Southwest Archaeological Research and Her Love of the Southwest Culture and Its People”at the State Line Restaurant Sept. 15. Price, a research associate with JRI, has worked for more than 20 years at the Three Rivers Petroglyph Site, where she conducts tours and gives presentations about the cultural landscape of the region. She has published numerous articles about the Native American ancestral homelands.